When I would come home from school growing up, the first thing that would greet me as I walked in the door was the smell of something good cooking. My own daughter starts school today, and I couldn’t let the day pass without a homemade treat. What could be better for her first day of school than milk and cookies? 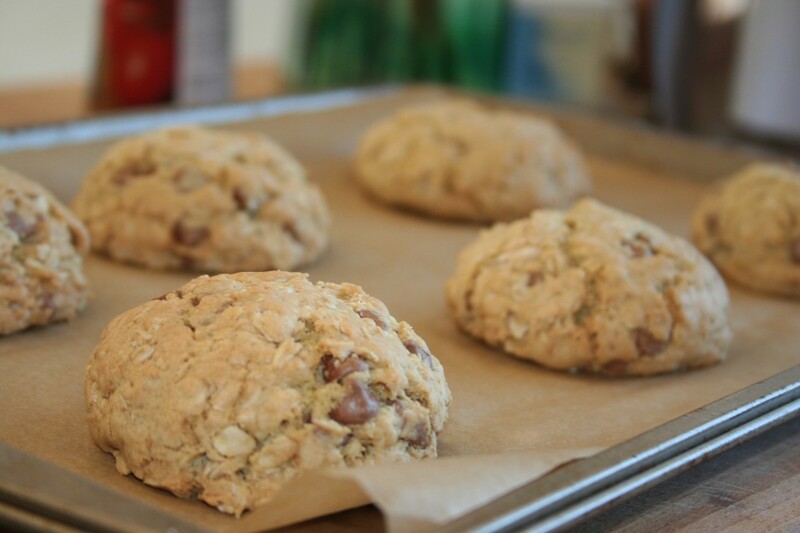 And a big, warm, fresh‐from‐the‐oven oatmeal chocolate chip cookie at that. This is my absolute, hands down, all‐time favorite cookie recipe. Using a 1/4 cup measuring cup to scoop out the dough is key, though — their generous size is part of what makes them so perfect. I love having one with a cup of tea or coffee, or even for breakfast (it has oatmeal in it, so it’s practically granola, right? ), and I make a version of these for Christmas with white chocolate, pecans and dried cranberries too. And now I will love them even more, as I’ll always think of this now as the treat I made on such a special day for my not‐so‐little girl. Put a large pot of salted water on to boil. Cook the bacon in a heavy large skillet over a medium‐high heat until brown and crisp. Using a slotted spoon, transfer to paper towels to drain. Pour off all but 1 tablespoon of the drippings from the skillet. Add the onion and saute until soft, about 3 minutes. Add the wine and boil until it has reduced by one‐third, about 3 minutes. Add the zucchini and saute until it’s crisp‐tender, stirring occasionally, about 5 to 7 minutes. Meanwhile, cook the pasta until al dente. Drain. Add the chopped tomatoes and basil to the zucchini and onions and continue to saute on a medium heat while the pasta cooks, about 10 to 15 minutes. 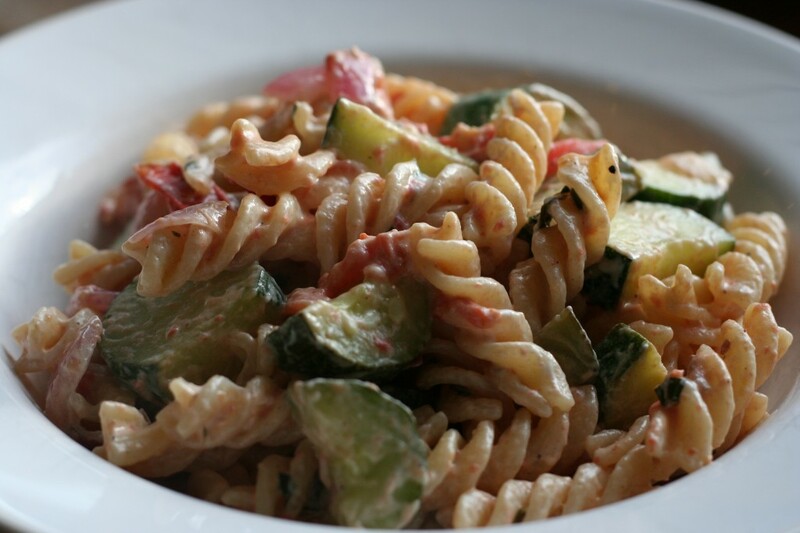 Add the drained pasta to the zucchini and tomato mixture in the skillet (or if your skillet isn’t big enough to hold everything, put the drained pasta back in the pot you cooked it in and pour the vegetable mixture from the skillet into the larger pot). Toss over a medium‐high heat until the sauce coats the pasta, about 3 minutes. Add the goat’s cheese and stir until it starts to melt, about 2 minutes more. Season to taste with salt and pepper and serve. Preheat the oven to 325°F (160°C). Grease cookie sheets or line them with parchment paper or silicone baking mats. Sift together the flour, baking soda, and salt and set aside. In a medium bowl, cream together the melted butter and brown and granulated sugars until well blended. Beat in the vanilla, egg, and egg yolk, mixing until light and creamy. Mix in the sifted ingredients, working until just blended. Stir in the chocolate chips and oats by hand, using a wooden spoon. Chill the dough in the refrigerator for 30 minutes to 1 hour. Use a table knife to scoop and press the dough into 1/4‐cup measuring scoops (0r roll 90 g of dough into a ball for one cookie), and plunk the mounds onto the prepared cookie sheets. Cookies should be 3 inches apart. Bake the cookies for 15 to 20 minutes, or until the edges are lightly browned. Cool on baking sheets for a few minutes before transferring to wire racks to cool completely.